Protection lasts for months, not weeks! Looks outstanding on any color paint! Use it by itself or apply it on top of a coating! 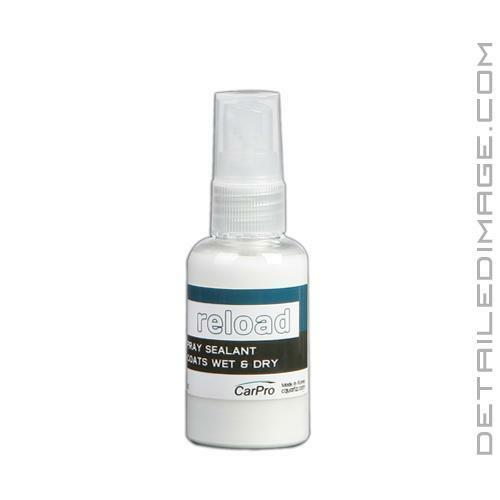 To simply call the CarPro Reload (formerly known as Reload Spray Sealant) a spray on protection product, would be a huge understatement. This product can very quickly protect and enhance the shine of not only your paint but also the rubber, glass, plastic and more. This unique spray on protection is truly a one of a kind product that can help any detailer get great results in less time as it's remarkably easy to apply and remove. Spray it on the paint just after washing or just after it's dried, with light pressure wipe away any excess with a clean microfiber towel (i.e. DI Microfiber Ultra Plush Two Sided Towel). Only light pressure is needed and you'll be amazed at how effortless the removal process is. The shine it leaves behind is incredible and the protection will last several months. The protection is strong enough that you can use it as a stand-alone product or to supplement another layer of protection on the surface already. Use it on top of coatings, sealants and even waxes in a well-ventilated area with gloves to be safe. An entire vehicle should only require about one to two ounces of product depending on its size, so you get a tremendous value from just one bottle. So if you are tired of an average shine and mediocre protection from a spray on product pick up the CarPro Reload. I believe it was a couple of years ago when I first saw this amazing sealant. I thought at first, it was pricey, but being a car show detailer, it was my job to try new products out and this just came out on the market. So once I spray it on and wiped it off, I was stunned as to how gorgeous all of the vehicles that I applied this product on looked! Its easy to use and all you do is wipe it on and wipe it off and watch it shine for you! It is far superior than any other product i have used and will continue to use this product as one of my best car detailing products for show! Last spring I bought a super clean Arctic White 2014 MB E350 sedan. It came with the Simoniz Glasscoat which was applied by the dealer. I've been detailing my cars for 30 years and while many of you will say that Glasscoat is bogus, I can tell you for a fact that it's not. While it may not be as good as some of the super premium products, it makes a white car glow without being over the top. I found out after a whole lot of research and phone calls that GC & ReLoad share similar Si02 chemistry so it made sense for me to give it a try as a top coat/booster. I have now used it about 8 times since the spring and I can say that it does a really nice job of boosting the shine and making the finish more slippery and thus easier to clean. It's super easy to apply but you have to pay attention to the wipe down as it will streak and require additional but not difficult work. Overall I would rate it very highly, and I will continue to use every few washes.